Amaryllis is a popular plant grown in many homes and gardens. Amaryllis can be easily propagated from seed, but is most often accomplished by way of offsets or cuttage of amaryllis bulblets. While you can propagate amaryllis by seed, it will take them at least three to five years to mature, or flower. You should look for seedpods within four weeks of flowering. Once the pods are ready to harvest, they will turn yellow and begin splitting open. Gently shake out the black seeds into pots or flats. Seeds should be sown in shallow well-draining soil and lightly covered. Place them in partial shade and keep the soil moist, gradually adding more light as they grow. Generally, the seedlings can be thinned as needed and then transplanted into the garden or larger pots within a year. Since seed-grown plants may not produce exact replicas of their parents, most people prefer to propagate the offsets. Amaryllis offsets can be dug up and divided once the foliage dies down in fall. Carefully lift the clumps from the ground with a shovel or garden fork or slide the plants out of their container, whatever the case may be. Separate individual bulbs and look for firm bulblets that are at least a third the size of the mother bulb. Trim back the foliage to about 2 or 3 inches above the main bulb and gently snap off the bulblets with your finger. If desired, you may use a knife to cut them off instead. Replant offsets as soon as possible. You can also propagate amaryllis by way of cuttage. The best time to do this is between midsummer and fall (July to November). Select bulbs that are at least 6 inches in diameter and cut them vertically into four (or more) pieces, depending on the bulb’s size—larger pieces usually grow quicker. Each section should have at least two scales. Apply fungicide and then plant them with the basal plate facing down. For cuttage grown plants, cover a third of each piece with the moist soil. Place the container in a shady area and keep it moist. In about four to eight weeks, you should begin to notice small bulblets forming between the scales, with leaf sprouts following shortly thereafter. 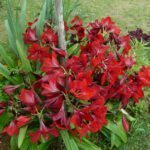 When replanting your amaryllis bulblets, choose pots that are at least a couple inches larger than the bulb’s diameter. Repot baby amaryllis bulb in well-draining potting soil mixed with peat moss, sand or perlite. Leave the bulblet sticking halfway out of the soil. Water lightly and place it in a partially shaded location. You should see signs of growth within three to six weeks.